By the way HAPPY APRIL! What a first quarter to 2019! What a launch of my first makeup line of lipsticks. Thank you so much to everyone that has made a purchase and I am excited for the future of DHM. What I'm learning the more I delve into this endeavour is the art of taking risks, being bold and believing in yourself which all fall under the umbrella of stepping out of your comfort zone. I'm learning and loving this journey of business and entrepreneurial ship and look forward to the future. So I am launching my very first ever cosmetics line! Yay! The campaign will kick off with editorial photos and a video with emphasis on the cosmetics. This has been a dream in the making and I am so so grateful for the push. Thank you Coach Aaron T Aaron special shout out to you, to all the DHM supporters from Day 1 – I appreciate you. Thank you Ciara for the song, “Level Up” – I’m out here trying girl! To the models and assistants that will carry the campaign – I am also grateful and to my marketing and PR team – a BIG thumbs up and thank you in advance. More to be revealed in early 2019. So I thought I would write a blog on teaching makeup and somewhat my previous experience. From planning my first masterclass to its execution in October 2016. I have learned a few things I would like to share and also take this time to invite you to the next DHM Masterclass. So I remembered speaking to a friend and she said will there be badges? And a light bulb went – I need assistants who could easily be identified at the class and so on. Whilst planning I also thought it’s a whole day so I would need students to be kept entertained and therefore refreshments would be required. As well as this it is a makeup class! So….of course makeup goodies would need to be provided so students could practice at home. I think these have always worked and made the class worthwhile. Moreso, people who attend also want to learn about the why, the latest products and what it can be used for. I often enjoy telling people what works, what’s trending and of course the offers on makeup cosmetic brands. Do join us for a full intense training makeup class on Saturday 29th September in London from 12pm. D H M is 4 ! Wow at 4 years I'm so grateful for what DHM has accomplished and where we will be in the next four years. From an idea birthed into a vision and this is just the beginning - the best is yet to come. From photoshoots, masterclasses, clients and magazines - I'm very excited for the future in makeup artistry and entrepreneurial-ship. 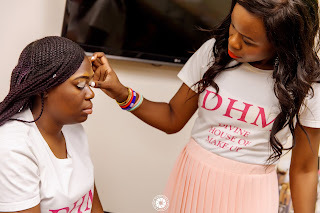 And who knows, maybe a DHM Line may be coming to a store near u soon💕...DHM is 4 today!🎉🎉🎉🎉Yay! Thank you for the support, encouragement, advice and love! I am so grateful. This was the theme for my just gone 2018 Spring/Summer photoshoot. And I couldn’t have done it without the help of a fantastic team. I named this theme “Sparkle” or “éclat” in French because I believe every person should sparkle, especially after a lovely makeover. The nature of Divine House of Makeup photoshoots is always to have a bold lip or something bright on the eyes. I believe this is what I’m known for and what actually works for my brand. With the help of MAC cosmetics, LA girl, Morphe, to really name a few – I was able to execute a fabulous photoshoot and I’m very excited to be continuing the campaign of my JOY, PEACE & LOVE lashes – JPL By DHM. So I have just wrapped my third photoshoot and all glory to God for a successful shoot. In doing this and executing this I came across a few tips I would like to share for those planning anything of this nature or just day-to-day life! I came up with a checklist that I use each time I'm planning one of these and definitely help and assistance is needed for any project! If all is planned, well in advance, then you are on your way to success! May this year fill your hearts with joy, peace and love! Merry Christmas and a glorious 2018! Wow 365 days just like that ! God we thank you. Jesus Hallelujah to your name! MMT 12: Use a hint of lemon essential oil no more than £2 in price and mix with facial creams/cleansers for optimal results.